Idealized illustration of family at the holiday appears in William Makepeace Thayer's Merry Christmas: A Christmas Present for Children and Youth. A popular children's writer, Thayer attempted to weed out the pagan traditions from Christian piety, but during the 1800s it was a losing battle as the "fun and frolic" he condemned became mainstream. 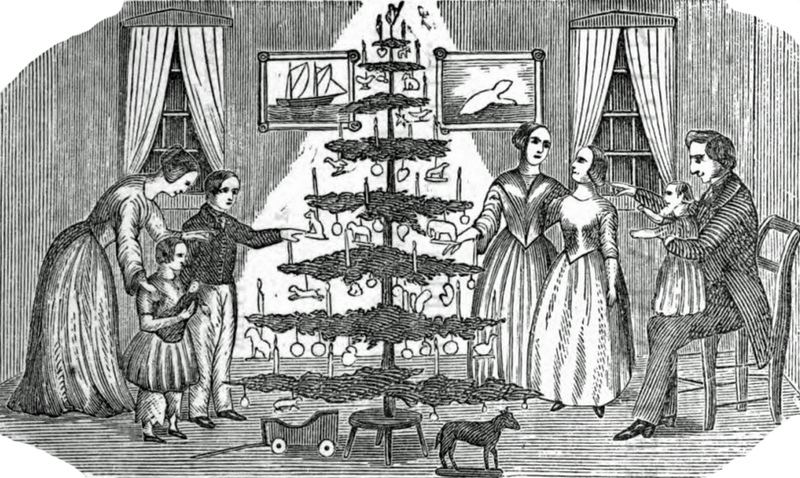 In the mid-1800s, Christmas had not yet become the giant commercial holiday it is today. It was still a major Christian holiday, however, and Sheffield Peabody clearly had strong ties to his church. Regardless, the attention the Genesee Valley farmer paid the holiday varied from year to year and was often nonexistent. On December 25, 1849, Peabody made no mention of the holiday at all, only writing of the cold and of going to school as if it were any given winter day. His 1852 Christmas Day entry was similar: “It froze up last night. Snowed a little. We have put 90 bushels of oats in the wood house chamber.” The cold was often his number one worry, especially where food was a concern. Other years he wrote about “thrash[ing] timothy hay” or “chopping wood.” Knowing Peabody’s year-round workload puts these less-than-festive Christmases in perspective, however, as he often worked outside all day out of obligation to the farm and to his family. Additionally, his writing was often matter-of-fact, sometimes leaving out more family- or leisure-oriented details. On December 25, 1855, Peabody made no entry, which is somewhat surprising considering his entries throughout the journals are near-daily. Does this mean he was busy with actual holiday festivities? Or just with farm work? It is difficult to say. Still, it is evident that there was celebration some years (although there is no evidence that his family definitely did not celebrate every year). He occasionally wrote about dinners or having company, so it is not as if he ignored Christmas altogether. In 1854, he mentioned killing a turkey that weighed “17 pounds when plucked” and dressing it for Christmas dinner. In 1856 he wrote, “Today is Christmas.… There is an oyster supper to Miss Grover's.” Food may have been at the center of his workload, but it was also central to celebration. Sheffield Peabody’s father died on December 25, 1859. “Father died few minutes past 7 o'clock, A.M. with asthma consumption. Dropped quite sudden,” was his entry for the day, and no mention of Christmas was made.